Heading to Mount Martha on Victoria’s Mornington Peninsula, inside co-editor Jan Henderson discovers a unique house designed by Bird de la Coeur Architects that is particular in every aspect. As a home by the sea, Mount Martha house redefines the idea of a beach residence where architecture and design are the protagonists. For some people there comes a time when the dream of an ocean vista beckons and the idea of moving from the city to the coast gathers momentum. Many purchase a seaside home and visit on weekends, while others make the ultimate sea-change and move to a place more restful. For James Launder the idea of this transition was 13 years in the making and settling into life in his spectacular home that boasts outstanding 180-degree ocean views has been worth the wait. Launder purchased land in Mount Martha in 1999 and commissioned Bird de la Coeur Architects to create a unique home that he would build; however, the project was not to be realised for some time when work and life permitted. During these years a special relationship developed between client and architect and this has manifested in a spectacular result – a home designed with stunning architecture that transcends any semblance to the ubiquitous seaside dwelling. 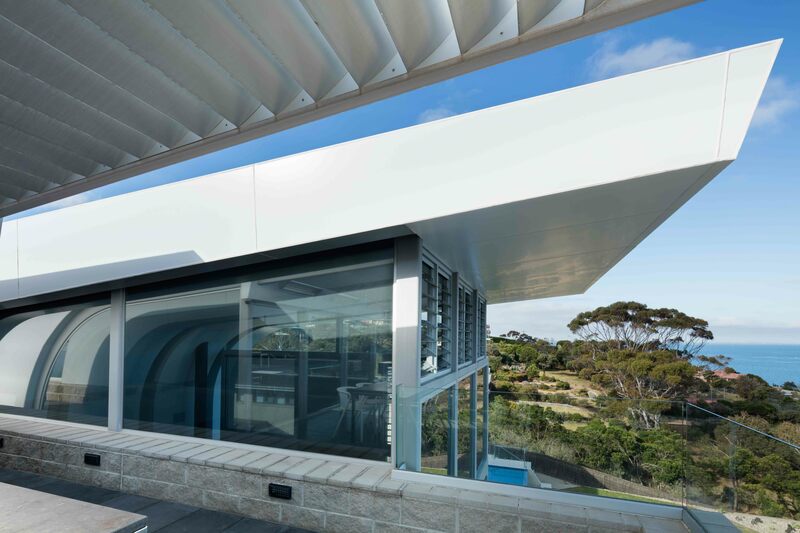 The concept for Mount Martha house was designed by Neil de la Coeur all those years ago when the land was purchased, and Vanessa Bird took the project forward, developing the ideas to make the house a reality. The site was difficult, located high above Mount Martha village with a steep 17-metre land-fall from front to back. 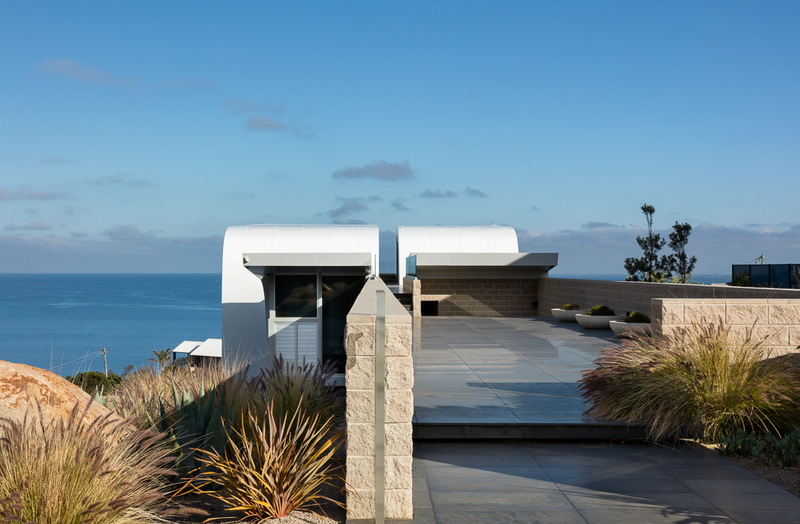 The challenge was to create a private house with maximum sea views and minimal outside intrusion. Not an easy brief, however, the Bird de la Coeur solution was ingenious and original, and is a spectacular success. From the moment of arrival at Mount Martha house, the idea of architecture as hero is indisputable. The initial view of the house from the street is a surprise, an individual design that is uncompromisingly modern and a precursor of what lies ahead. The house itself is divided into two apparently independent buildings separated by a solid masonry spine and the roofline sits high in the sky above the horizon with no hint of the multi-level dwelling below. The journey of discovery begins kerbside, not at the front door, as an enormous, 23-metre bluestone paved walkway beckons the visitor towards the house proper. Below this level and to the left is an open car parking area that leads to a garage and private entrance. The walkway leads to a large bank of bluestone steps (think Gehry’s Guggenheim Museum Bilbao) that descend to a lower level and the front door and, once inside, the complexity of the design unfolds against a backdrop of curated views of land and sea, architectural form and contemporary interior design. From the entrance, there are two hallways, set at right angles to each other, which lead to the front area of the house and communal spaces. This is the heart of the home, an open space with a combined kitchen/dining area that is all clean lines. 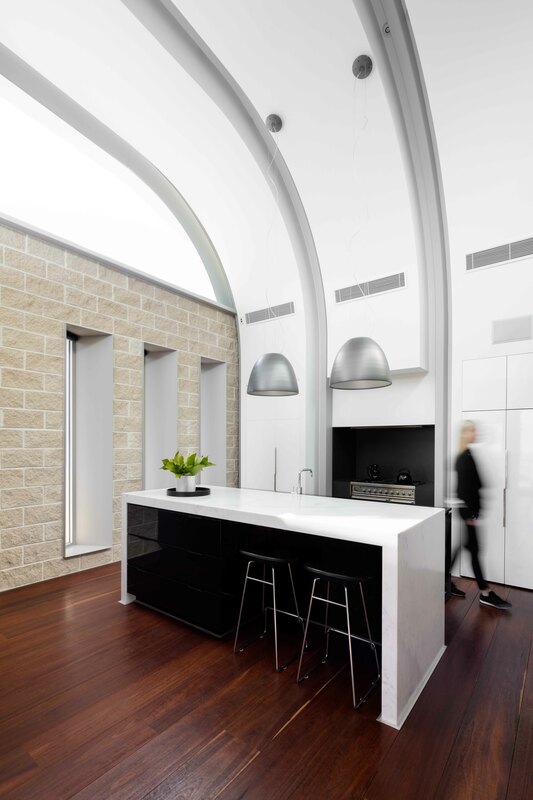 In the kitchen two Nur Halo pendant lights (Artemide) have been positioned above a Carrera marble topped island bench and the integrated refrigerator and pantry located either side of the oven (Ilve) are discreetly hidden from view. The adjoining dining space features a Moller dining table (Great Dane), Wishbone chairs in a natural finish (CULT) and a bespoke cabinet that appears to ‘slide’ into the floor (Bird de la Coeur Architects design, client made). The adjacent living space is filled with a curved modular lounge and Venus and Mars coffee tables (King Living) and iconic occasional furniture pieces such as a PK 22 (Fritz Hansen, Cult) and Arco standard lamp (Euroluce). 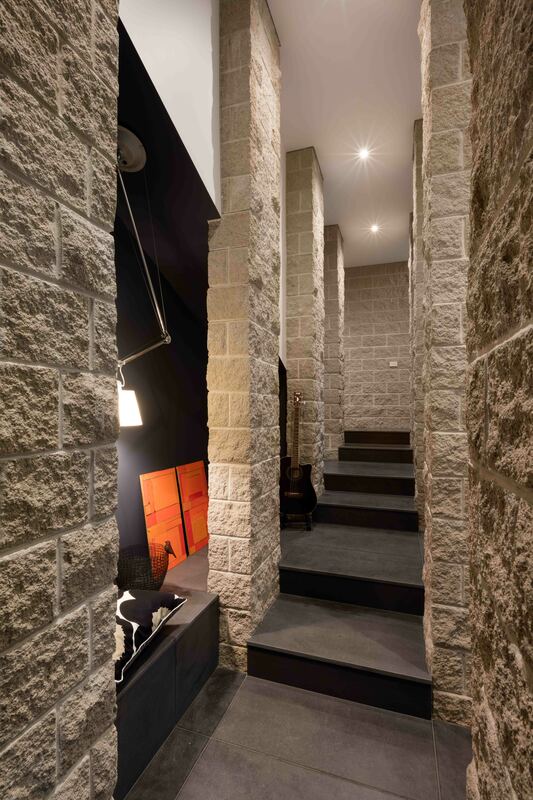 The real charm of this project, however, is in the spatial quality of the architecture that offers an intimacy incorporated within volumes and voids. The ceiling line is curved, set high at six metres, and wraps around the roof with rectangular windows placed between the solid wall and the ceiling. Facing the ocean, large windows frame the vistas beyond these rooms and an outside deck offers premium views of the seascape, the pool below and the garden that follows the escarpment to the edge of the 2200-square metre block. A fine design decision was not to fence the property, as this allows the landscape (designed by Sitedesign + Studios) to flow and merge with adjoining parkland. The detail of the layout of the interior of Mount Martha house is manifold, with numerous levels and interesting spaces. The house is a multigenerational shared home with family and friends visiting regularly. So, with privacy uppermost in mind, the sleeping quarters have been cleverly spread throughout the spatial plan of the house. The master bedroom and bathroom with private deck are situated behind the kitchen and on this level, adjacent to the front door, is a well-proportioned study with access to the outside parking area; on the north side of the house downstairs are two bedrooms, a bathroom with a deck that leads to the pool; and there is a self-contained guest suite (behind a concealed door) off the entrance hallway. On the pool level there is a substantial theatre room with 3.8-metre high ceiling, a fabulous inclusion with three large circular sofas (Delta, Circle, King Living) fit for a crowd; and on the very top level of the house is an outdoor cabana and entertaining area with outdoor kitchen, a bespoke table of stainless steel base topped with Fossil marble (CDK Stone), Jasper Morrison Air armchairs (Magis, CULT) and, of course, the most spectacular views. 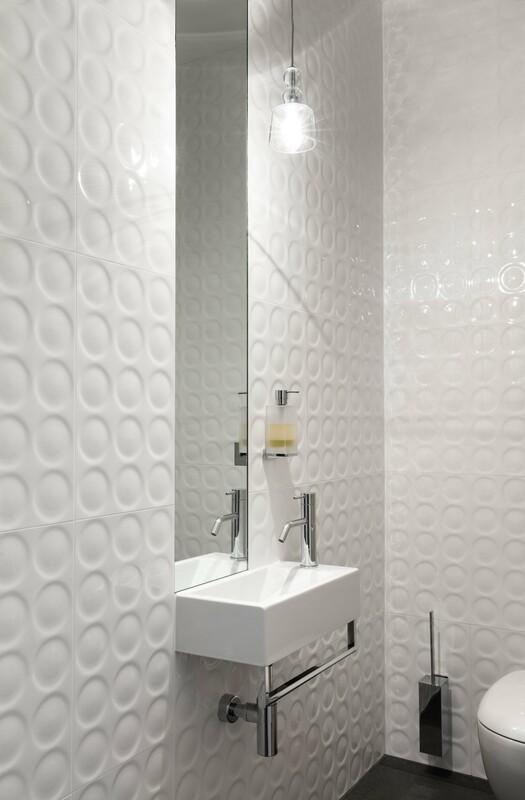 For this project the choice of materials has been rigorous and products used have a practical application and robust aesthetic. Bluestone tiles, spotted gum timber flooring and Split Face alabaster blocks (Boral) have been used throughout and create a continuum of colour and texture, while European oak timber doors and rich honey plywood stair rails (Armourply) offer lightness and warmth. The mellow palette of dark blue-grey, brown, blonde, white and accents of black enhances the architecture and echoes the surrounding landscape of sea and sand. Windows of differing sizes and shapes have been strategically placed throughout the house to curate particular views of sky, land and sea, and these not only shield those within, but also allow connection to the outside. And there is delight in the detail where a small space is given over to showcasing instruments from the client’s guitar collection or finding a small nook that is filled with multiple pendant lights in vibrant colours (Ultraslim, Mance Design). There are decks on which to sit and read or just enjoy the view, and spaces to entertain a few friends or a crowd. There is privacy from the outside and privacy from other houseguests and then there is the landscaped garden with giant fire pit situated at the bottom of the garden, as well as the infinity pool with outstanding views of the Mornington Peninsula. They say that all good things come to those who wait, and this project took some time; however, Bird de la Coeur Architects has created an architectural jewel. Was it worth the wait? Yes indeed. This is a project that will stand the test of time and a house that will give pleasure for decades to come.